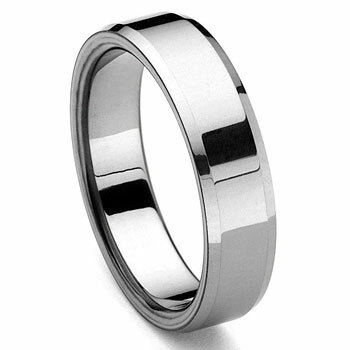 A beveled tungsten wedding ring . This wedding is the best to represent your love as it will stay permanently polished. Simplicity never goes out of fashion. It is one of the timeless wedding band design similar to the plain dome wedding band style. For those who prefer have engraving put on the outside of the ring, this is one of the most popular styles for doing so. The flat center part is perfect for laser engraving, the result is a stunning personalized ring that is uniquely for you. This ring is made in comfort fit design. this is a repeat purchase so if that says anything. I would not have purchased again if they did not have great quality products. Great ring! Good customer service! Quick shipping and processing! Very satisfied! Very nice looking ring. My husband gets compliments on it all the time. I recently purchased this ring for my husband as he lost his previous wedding band. It was his Valentine's day gift and I couldn't be more satisfied. The picture does it no justice.It looks great on him (if I do say so myself :)) The best part was how fast it got shipped to me. Titanium Kay has great service.This is the second ring I purchase here and I most definately will purchase again! Very hard construction, heavy and Shinny. Looks good, professional and makes good impreasion to others.